If you know me, you know that I love Harry Potter. I see a great deal of myself in Hermione. I have a mild to moderate crush on Bill Weasley. I’m inspired by Professor McGonagall. I think that I might be Tonks. I love both Remus Lupin and Sirius Black. I could keep going on this train. But the elder I wax, the character who strikes me time and again is Neville Longbottom. On the surface, he seems pretty straightforward. He’s clumsy and forgetful. He isn’t too smart or too attractive. His best subject is Herbology, which is a commonly overlooked subject at Hogwarts. He doesn’t appear to be terribly brave. He didn’t demonstrate any indication of magical ability for much of his childhood. He lives with his grandmother. His parents are permanent patients of St. Mungo’s thanks to the “skills” of Bellatrix Lestrange. And yet, in the spite of all of this-or perhaps because of it, he is a true Gryffindor. Despite his normal awkwardness, Neville shows strength in difficult situations. In the first book, Ron tells the eleven-year-old blunderbuss “Neville, you have got to start standing up to people.” The Neville to whom Ron is speaking not likely to stand up to anyone. He is shy and nervous. He doesn’t actively seek attention. He isn’t about to stand up to one of his own friends-let alone a powerful Dark wizard. Now as the books go on, we (and his friends) start to learn some of Neville’s backstory. He lives with his grandmother because his parents were horrifically damaged mentally after vengeful Death Eaters attacked them with the Cruciatus Curse after Voldemort’s 1981 fall from power. (You know, that whole thing where the most powerful Dark Wizard of the age was defeated by a toddler who was born the day after Neville. That.) His parents don’t remember who they are, let alone who he is. This greatly impacts Neville. To be honest, there is almost no way that a child couldn’t be impacted by this experience. Both in word and action, his family constantly tells him that he cannot live up to his parents’ legacy. He has had no reason not to internalize this idea. However even in his early years at Hogwarts, Neville shows hints of the bravery that will one day be acknowledged even by Lord Voldemort. Near the end of their first year, he is not afraid to stand up to Ron, Harry, and Hermione when he sees them doing something he believes to be wrong. Professor Dumbledore later commends him for this saying that it is harder to stand up to one’s friends than one’s enemies. He also stands up to an enemy (Draco Malfoy) at another point, but that is supposedly easier than standing up to the Golden Trio. Neville is also capable of remarkable love and faithfulness. He is loyal to his friends, but more than that, he is loyal to his parents. As he tells Harry in the fifth book, he is proud of being the son of Frank and Alice Longbottom. His parents thrice defied Lord Voldemort; that is decidedly something to be proud of. They may not know him; the only gifts his mother gives him may be gum wrappers. But they were good people who fought valiantly for what they believed was right. Neville does his best to carry their spirit on. As he grows older, he works to fight for the cause that his parents supported and to become a person who they would have been proud to call their son. In many ways, Neville seems to be determined to be someone of whom his parents would have been proud. He wants to live up to their legacy. He isn’t content to reside in their shadow. A large part of this is a desire to make them proud, but I believe that it also comes from a desire to continue their legacy. Just because his parents’ minds were destroyed and Lily and James Potter died, that didn’t destroy the movement. There will be others who will rise to take their place. Neville Longbottom shows us the importance of standing up for what we believe in and for always striving to be better. Perhaps our world needs more people like Neville. 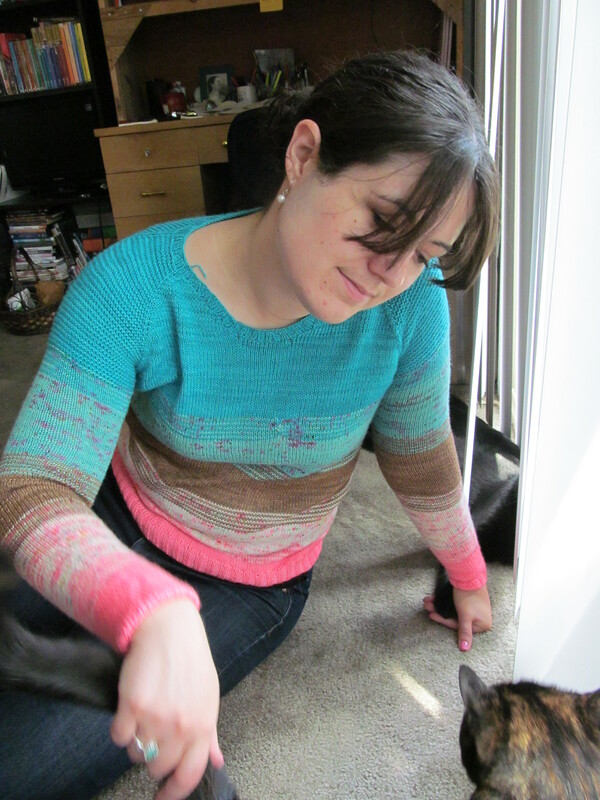 In late March, I was sitting a meeting of a local knitting group that I sporadically attend when we began discussing Andrea Mowrey’s Find Your Find pattern. Another group member mentioned that she wasn’t planning on starting one yet because she was waiting until the similar sweater pattern was released. 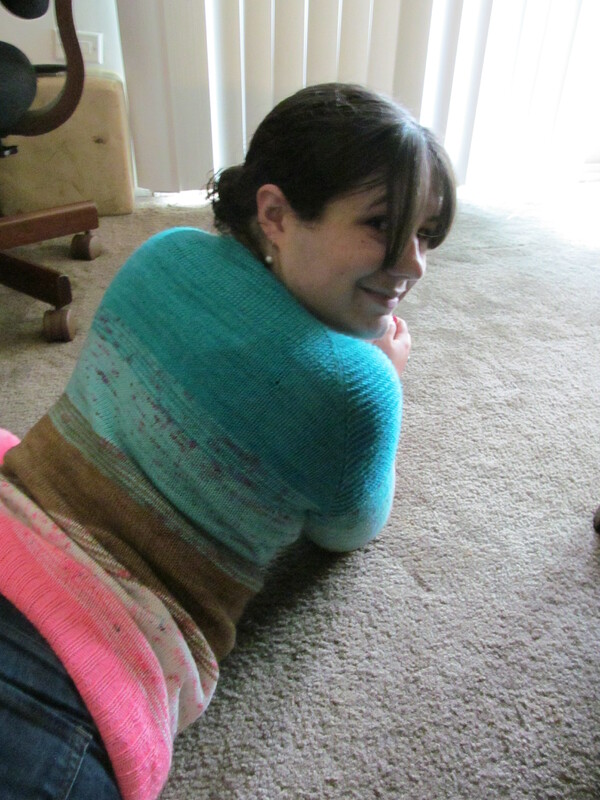 Now, I thought that the shawl was lovely although I hadn’t started plotting one of my own yet, but the idea of that concept/design on a sweater…now that was right up my alley. I waited patiently (ish) for the pattern to be released, and then when So Faded was released, I started toying with my stash to produce the best combination for a sweater. I have a couple of groupings packaged together in my stash to use to make future So Fadeds. But I didn’t use stash for this one. Around the time the pattern was released, the Plucky Knitter had a “Mix and Match” update filled with pairings perfect for So Faded, Find Your Fade, and Starting Point. One of the pairings was almost but not quite perfect for me, so I asked Sarah (aka the Plucky Knitter) if she could think of a good sub for the color that just wasn’t me and she gave me two choices. I picked one and bought five skeins of yarn on Plucky Feet. And now…we have my So Faded. From top to bottom: Fondant, SB005, Biscuit, SB001, and Cecilia. Joy calls this my dessert sweater. It supposedly makes her hungry every time she sees it. Therefore, I knew that we had to take pictures on National Ice Cream Day. Doesn’t it just look like a dessert sweater? The pattern is very straight-forward. The directions are well-written and easy to follow. I may have been knitting for several years, but I suspect that this would be a good pattern for a more novice knitter. I really enjoyed knitting it, and I’m planning on knitting a few more out of the pairings that I put together out of my stash earlier this year. I think that it could also be quite lovely if one chose to knit it out of only one color as well. 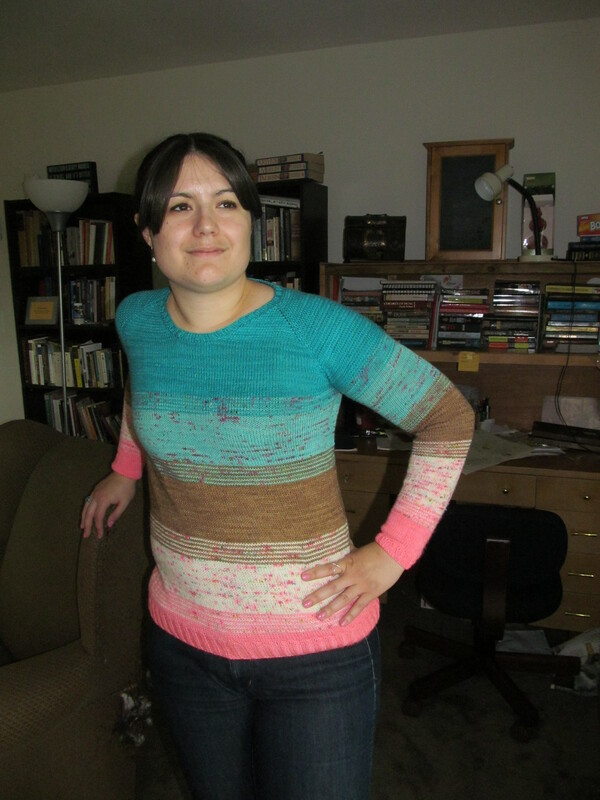 While it’s too warm for it now, this sweater will be perfect for fall and spring. It goes perfectly into the plan that I mentioned in an earlier post to add more lightweight sweaters to my wardrobe. I really like Plucky Feet for this purpose. It’s a sturdy yarn that knits up in a lightweight fabric that is quite delightful. As you’ve probably heard, I recently finished my masters degree. People keep asking me how I’m doing now that I’m done. They ask if I’m resting or recovering. I’m not entirely sure what people envision my life post-grad school to look like, but I don’t think they’re expecting what it is. So I went to my bookshelf and picked up G.K. Chesterton’s Orthodoxy. My brain required stimulation, and Chesterton is graciously accommodating me. Thus far, good ol’ Gilbert Keith seems more than happy to challenge me. He’s making me work and think in a different way than my grad school work did, but he is making me work. It’s funny, but I’m not sure that I want to rest in the way that people might suspect. I’ve always enjoyed working and learning. I do need a rest, but my mind cannot sit idle. It needs to be pushed. Fluff and chick lit make nice resting places, but my brain can’t live there. My brain needs to be stimulated and challenged. I suspect that I trained my brain into this over the course of my academic career. I’m sure that I have some natural predilection towards this, but I (and others around me) have also encouraged those tendencies in myself. I want to be one of those people who are, to quote Dorothy Sayers, cursed with both hearts and brains. I want to be someone who is always craving intellectual stimulation and seeking what is next. So…now I need to go finish reading my Chesterton. There’s a story that I tell people sometimes, and today I’m going to tell it to you, the blog…the internet. In early October of 2014, I was looking for a job. I had a job that wasn’t great, and I was looking for something better. On a Friday evening, I was looking at job postings, and I saw what I thought said “ELA Long-Term Sub.” ELA stands for English language arts, and it’s what I wanted to teach. Do a long-term sub job for a middle school English teacher at a school twenty minutes from my house? That sounded better than what I was doing. I applied. On Monday, the recruiter called me. The job posting had not been for ELA but rather ELL (English Language Learners). I’m pretty sure that the recruiter knew that I’d applied by accident, but she was willing to submit me to be interviewed if I was open to that. I went for it. I interviewed, and I was hired. And thus began a year of long-term sub jobs for ELL teachers. At the end of my first week in that first ELL job, I loved doing ELL work so much that I started looking for master’s programs in the field. I’d talked about getting a masters in EL/ESL/ELL/TESOL for a while, but now…what the heck? I loved this job. I could see myself doing this for the rest of my life. I submitted my contact info with one university and went outside to do my dismissal duty. That evening, someone from the university called me, I applied the following week, I was admitted, and I started classes in February of 2015. Effective July 2, 2017, I’ve finished that degree. I am allowed to throw MEd (Master of Education) after my name. I am an EL teacher. I did what I wanted to do. And I still want to work in this field. I still love this field. But the question of accident or coincidence or something else stays with me. Prior to that application, I had some concept that this field existed, but I had no clue as to what it really looked like. I had no idea what I was getting into. I’ve said various times over the past several months that if I’d known what I was getting into I’m not sure that I would have started. There were hard moments. I was challenged, and I didn’t always respond well. Ultimately, I grew, but I had some dark moments on that journey. Do I regret it? Not a bit. I’ve grown through this process. The challenges have been good for me. I’ve even enjoyed some of them. I didn’t enjoy the week when I worked so hard and pushed myself so hard that I became physically ill and mentally confused. I still don’t like watching videos of myself teaching/talking. But I enjoy teaching. I like the challenge of reading research articles about my field. The application of that research is a mental exercise and not exactly fun in the traditional sense of the word, but it was beneficial, for lack of a better word. So did I get into this by accident or coincidence? I’d say probably not, but I’ll leave that to history to decide.